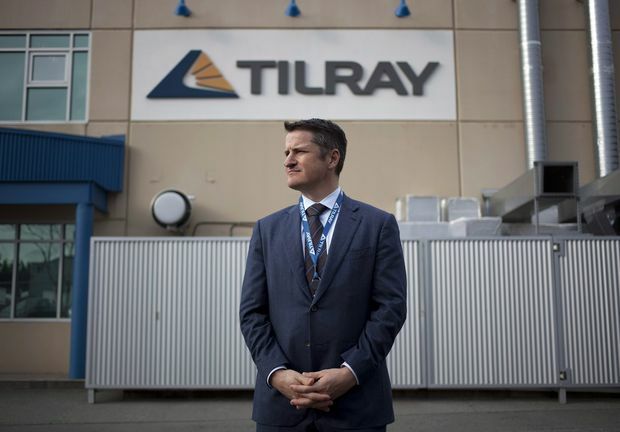 Tilray President Brendan Kennedy is photographed at the company’s head office in Nanaimo, B.C., on Nov. 29, 2017. Tilray Inc. is getting closer to going public. The Nanaimo, B.C.-based cannabis grower is looking to sell its shares for between US$14 and US$16 apiece (between $18.40 and $21), the company said Monday in a regulatory filing. That price range values Tilray between about US$1.3-billion and US$1.5-billion. Tilray has applied to list its stock in the United States on the Nasdaq. At that valuation, Tilray would be Canada’s fourth-largest publicly traded marijuana firm behind Canopy Growth Corp., Aurora Cannabis Inc. – which is buying MedReleaf Corp. – and Aphria Inc.
Tilray is offering nine million subordinate voting shares that each carry one vote. Its higher-ranked shares, of which most are owned by Seattle’s Privateer Holdings Inc., carry three votes apiece. (After this financing, Privateer will still control 93 per cent of the votes.) The offering will be sold on both sides of the border by underwriting syndicates led by investment bank Cowen and Co. LLC in the United States and BMO Nesbitt Burns Inc. in Canada. At US$15 a share, and assuming the bankers make use of their option to buy up to 1.35 million more shares, Tilray will raise about US$140-million from its initial public offering after expenses. The company says it will spend US$53-million to expand its production capabilities and US$37-million to repay debt that it borrowed from Privateer. Tilray would be Canada’s first cannabis grower to raise money by going public in the United States, though two domestic players are now dual-listed on a major market: Shares of Cronos Group Inc. trade on both the Nasdaq and the Toronto Stock Exchange, and TSX-listed Canopy also trades on the New York Stock Exchange. More than 100 companies in the nascent marijuana sector have gone public in Canada. The largest companies have been trading sideways for the past few months, as Canada moves closer to legalizing recreational cannabis on Oct. 17.